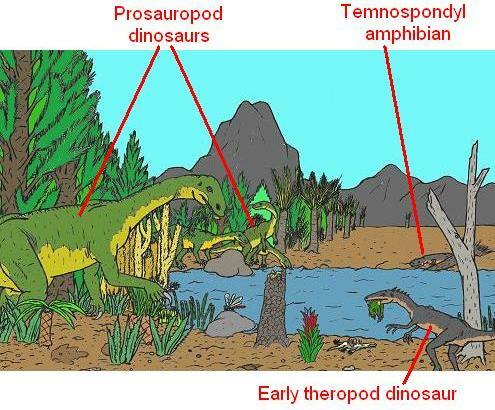 The Triassic period was the first of three periods in the Mesozoic Era (the others being the Jurassic period and the Cretaceous period), and occured between 248 million and 213 million years ago. It was during the Triassic period that archosaurs ("ruling reptiles"), including dinosaurs, crocodiles, and Pterosaurs first evolved. Prior to the Triassic, during the previous Permian era, mammal-like reptiles had been the dominant land animals. Some survived into the Triassic, but they dramatically declined, apparently out-competed by the dinosaurs. The mammal-like reptiles did however give rise to the first mammals, these being tiny mouse-sized animals. 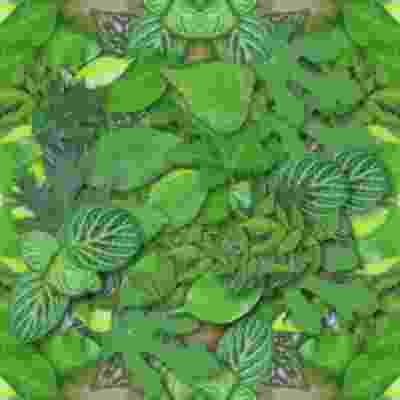 The dominant plants during the Triassic period were conifers, ferns, ginkgos and horsetails. The different geography of the world also led to a different climate. On the whole, the Triassic was generally hot and dry, and there was no glaciation or ice caps at the poles (polar regions were moist and temperate). 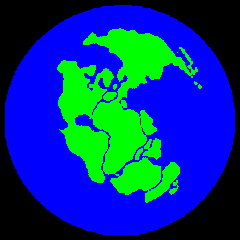 The interior of Pangaea would have had a highly seasonal continental climate, with very hot summers and cold winters. Before the Age of Dinosaurs there was an age in Earth’s history known as the Triassic. It was a world of truly fantastic creatures, a genetic stew of the ancient and the modern. During this time the Earth took its first steps toward the creation of modern terrestrial ecosystems. This incredibly exciting period is brought vividly to life in the words of paleontologist Nicholas Fraser and the consummate artistry of Douglas Henderson. Together they have created a book in which the riches of Triassic life are presented with clarity, scientific accuracy, and imaginative recreation. Every lover of the life of the past will treasure Dawn of the Dinosaurs. SAVE $ 3.00 with this SPECIAL BOOK SET - Great for Children Who Love Dinosaurs! This 4-pack includes each of the best-selling Dinosaur books from the Explore Series. With over 170 colorful images, these books include dinosaurs from each of these prehistoric periods: Jurassic, Cretaceous, and Triassic plus a BONUS book on the popular Bird Dinosaurs (also called Feathered Dinosaurs). Each dinosaur book includes a colorful image and is full of interesting, fun facts about dinosaurs from each period. If you don't own a Kindle Fire yet, don't worry. The images look amazing in color, but also display well on the classic black and white screen. With the neverending popularity of dinosaurs in cartoons, toys and Disney movies, dinosaurs are not just for people interested in fossils anymore. Although Jurassic Park is the most obvious example, especially when it comes to the T-Rex, the popularity of dinosaurs has exploded in recent years. Strangely enough, the T-Rex is not even from the Jurassic period; it's from the Cretaceous era. Who knew? They are fun for children and educational at the same time. A perfect learning tool. Although each of these books is available as a separate book, it makes sense to get all four at once and receive the great sale price when you buy them for your young dinosaur fan. Children love them! to these changes, became extinct. to spread throughout the globe. Here is everything young readers want to know about dinosaurs and their world--in one magnificently illustrated, up-to-date family reference. Discover the land of dinosaurs! After uncovering a magical book, a brother and sister duo are whisked away, soon finding themselves walking among the dinosaurs. This fantastical story introduces early readers to a variety of dinosaurs in the most entertaining way. Children will be swept away on this prehistoric adventure as they explore these colorful pages. A glossary at the end of the story provides fascinating facts about favorite dinosaurs that roamed the earth during the Triassic Era. Travel to the Triassic Era is a wonderful companion book, featuring different dinosaurs and facts. Add them both to your child's home library! "The illustrations are center stage... plenty of strong appeal for dinosaur buffs." This series of six books is for dinosaur enthusiasts and novices alike. It covers dinosaurs living in the six periods that make up the Mesozoic Age, which spanned prehistoric time 227 million years ago to 65 million years ago. Each book is an illustrated guide to 25 of the best known dinosaurs of that period. Up-to-date information accompanies the highly detailed computer-generated artworks -- big, colorful, lifelike, fill-the-page dinosaurs. The books open with an illustrated introductory spread that provides background information on the time period in which the 25 dinosaurs lived. The dinosaur spreads bear a brief introduction, information on when and where it lived, its size, and where fossil remains have been found. They also have a shadow icon of an adult, child, or animal (e.g. domestic cat) which indicates the size of the dinosaur. All dinosaur-loving readers will thrill at the giant and engaging dino artworks. These books are sure to be enjoyed over and over again. In the style of WHEN BUGS WERE BIG and WHEN FISH GOT FEET this book discusses all the exciting developments of the Triassic Age, from the recovery of the planet from the most deadly mass extinction ever, to the first appearance of the dinosaurs. We also get to meet the first mammals, the first pterosaurs (flying reptiles), the first frogs, a host of predatory marine reptiles, early turtles, and the first coral reefs. With the books' signature blend of humor and clearly presented information, cartoon illustrations help keep the fact-filled material extra fun. Told in rich detail and with gorgeous color recreations, this is the story of marine life in the age before the dinosaurs. During the Middle Triassic Period (247–237 million years ago), the mountain of Monte San Giorgio in Switzerland was a tropical lagoon. Today, it is a UNESCO World Heritage Site because it boasts an astonishing fossil record of marine life from that time. Attracted to an incredibly diverse and well-preserved set of fossils, Swiss and Italian paleontologists have been excavating the mountain since 1850. Synthesizing and interpreting over a century of discoveries through a critical twenty-first century lens, paleontologist Olivier Rieppel tells for the first time the complete story of the fish and marine reptiles who made that long-ago lagoon their home. Through careful analysis and vividly rendered recreations, he offers memorable glimpses of not only what Thalattosaurs, Protorosaurs, Ichthyosaurs, Pachypleurosaurs, and other marine life looked like but how they moved and lived in the lagoon. An invaluable resource for specialists and accessible to all, this book is essential to all who are fascinated with ancient marine life.